Azure sky, robin’s egg blue – vivid shades of turquoise define the colour that’s named after this gem. 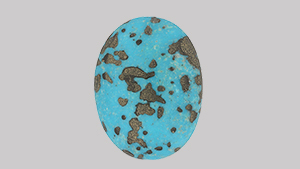 This turquoise is cut in a cabochon: the most common shape. The preferred colour for turquoise is a pure sky blue. Some buyers prefer the presence of matrix in fashioned turquoise. 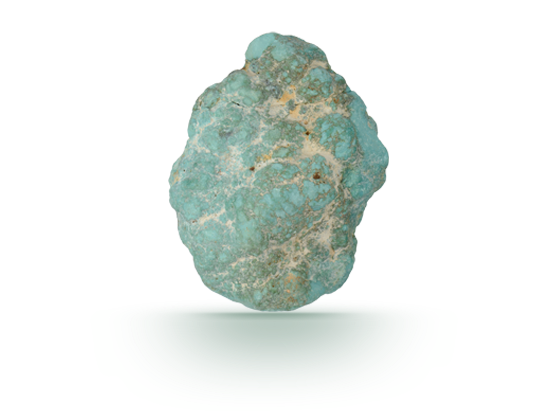 Turquoise is an aggregate of microscopic crystals that form a solid mass. The intense blue colour in this rough is due to the presence of copper. Veins of matrix in this turquoise are remnants of its surrounding rock. Turquoise is found in only a few places on earth: dry and barren regions where acidic, copper-rich groundwater seeps downward and reacts with minerals that contain phosphorus and aluminium. The result of this sedimentary process is a porous, semi-translucent to opaque compound of hydrated copper and aluminium phosphate. Turquoise is the traditional birthstone for the month of December and the gem of the 11th wedding anniversary. Turquoise buried in Ancient Egyptian tombs is among the world’s oldest jewellery. Montezuma, thinking Cortes was Quetzalcoatl, gave him the god’s favourite gem: turquoise. The spiderweb of veins that appear in turquoise are matrix: evidence of the surrounding rock. A legacy of turquoise appreciation spans the globe, from ancient Egypt to Mesoamerica to China. 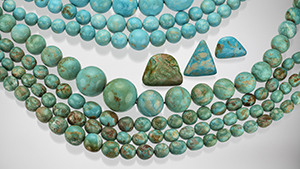 Turquoise is coloured by copper, which creates some of the most vivid blues and greens in gems. Turquoise is judged on its colour, texture, and the absence of matrix. 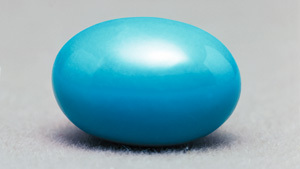 The even blue colour of this cabochon would be called Persian blue in the trade. 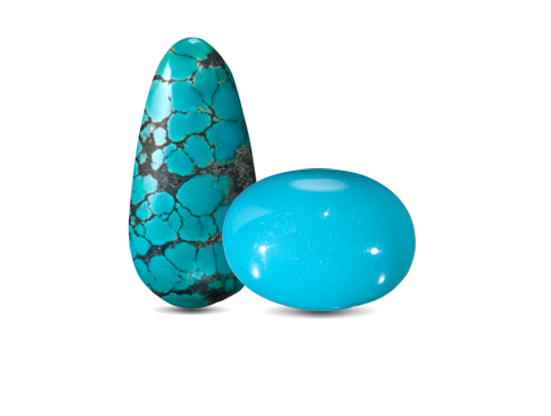 These free-form turquoise cabochons show a typical matrix pattern. Although turquoise is usually cut into beads and cabochons, it can also be carved. Cutters work around large areas of matrix to yield pieces of evenly coloured turquoise.